Home » General Health » Is Gingivitis Contagious? Who Is at Risk? Gingivitis is an early warning sign that your mouth could be in trouble. Is gingivitis contagious? That depends on the trusted expert offering the advice. Understanding what gingivitis is and how it can affect your oral health may help answer this question. The good news is, gingivitis may be treatable, and with proper care and management, this gum disease may be curable. Gingivitis is a form of the oral gum disease known as periodontal disease. The gums may become inflamed, red, swollen, and present bleeding when brushed. Gingivitis refers to the irritation of the gingiva, which comprises the mucous membranes and fibrous tissue that form the gums in the mouth. As this area of the mouth runs along the base of the teeth, the bacteria that causes gingivitis can expand into the bone of the teeth if not removed with brushing and flossing actions. The bacterial strain can damage the gums and tissues to form pockets between the gum line and tooth. This allows bacteria, plaque, and tartar to settle within these pockets. Gingivitis may then lead to a more serious form of periodontal disease, forcing the teeth to loosen and even fall out of place. In addition to the tenderness, inflammation, and bleeding of gums, gingivitis may also present bad breath and pain. This depends on the source, as some experts believe gingivitis is contracted through poor oral hygiene and factors such as diet, smoking, medication, and stress. Others, such as the American Dental Association, offer evidence that any of the gingivitis bacterial strains may be contagious and spread through saliva. It may be transmitted by kissing, shared use of utensils and cups, or by direct contact with saliva containing the bacteria. More importantly, although gingivitis may be contagious, it is preventable as well as treatable. Maintaining a rigid cleaning schedule of the teeth with proper brushing and flossing techniques may help to stop the spread of gingivitis. How Can You Spread Gingivitis? Gum disease is seen in those experiencing a fluctuation of hormones or with an associated health condition that weakens the immune system. Gingivitis may also be spread by the exchange of saliva with those affected, as earlier noted. The bacteria linked with gingivitis may be spread through the sharing of flatware and by kissing. This should not be a concern for those with good oral health and those who follow proper oral hygiene. In some cases, gingivitis may spread from mom to baby if the mother has the A. actinomycetemcomitans bacterial strain, according to the American Dental Association. They report the risk of spreading this gingivitis bacteria to children under three years old as 26 times more likely under this circumstance. Yes, gingivitis is curable. Gingivitis is the early stage of periodontal disease and, if caught early, may be reversed before permanent damage is done. Once it develops into periodontal disease, the bones become affected and pockets form between the tooth and the gums. This allows bacteria to invade, and infections, tissue loss, and even tooth loss are possible. At the first signs of gingivitis, proper care and cleaning of teeth at home is crucial. It is important to take care of your teeth and mouth at all times, but if there is blood, tenderness, or inflammation of the gum line, extra care is necessary. With proper cleaning of teeth and gums, it may take up to 14 days to treat gingivitis. Without knowing how to cure gingivitis properly, the healing process may last longer. Gingivitis symptoms that linger, or do not dissipate after two weeks, may have developed into periodontal gum disease. A visit to the dentist is required to prevent further damage at this stage. Who Is at Risk for Gingivitis? Everyone may experience plaque at one time or another, but many people are at a higher risk for gingivitis than others. Females are susceptible to oral diseases such as gingivitis with the fluctuating of hormones throughout their lifetime. Teenaged and menopausal women may experience sensitive teeth and gums. Pregnancy, especially in the later stages, sees an increase in hormone production. This may lead to bleeding gums and a condition known as hypertrophic gingivitis. Seen only in pregnancy, this form of gingivitis may present with a small, red tumor at the baseline of the teeth. This is benign but can lead to bleeding. Postmenopausal sufferers may develop desquamative gingivitis, which can lead to the teeth becoming loose as the gum line separates from the tooth itself. Excruciating pain is common once the nerves are visible. The diabetes disease suppresses the immune system, lowering its ability to fight infections and bacterial invading pathogens. Plaque buildup becomes tartar, which is a hard substance that irritates the gum line along the base of the teeth. This can cause inflammation and bleeding of the gingiva. The use of tobacco products may increase the risk for gingivitis twofold, as smoking suppresses the immune system much like diabetes. Plaque can build faster and the continuous use of tobacco may also impair the gum line’s healing process. Our tissue cells and bones, including the teeth, require sufficient amounts of antioxidant vitamins to maintain a healthy environment and for natural repair. Having a deficiency in vitamin C, folic acid, and riboflavin may have a direct effect on the health of our mouth by leading to gingivitis. Emotional and any physical stress may cause the development of acute necrotizing ulcerative gingivitis. 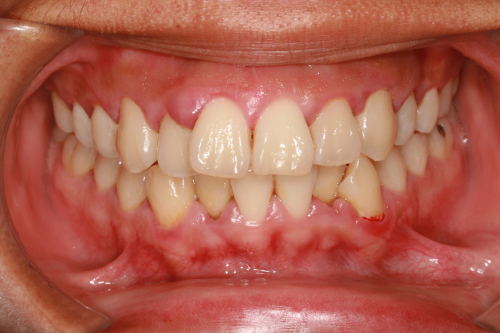 This form may present sudden bleeding of the gums accompanied by severe pain. Common dental issues that present a higher risk for gingivitis may include crooked teeth, fillings, improperly fitted dentures and plates, poor cleaning of braces, and some medications such as birth control pills. Gingivitis prevention begins with proper oral hygiene care. By following several key steps every day, gingivitis and other gum disease may be preventable, and the health of your mouth will remain in good standing. Brush your teeth twice daily and at bedtime. Use a toothbrush with soft bristles and a small head. Use the toothbrush along the gum line when brushing. Allow fluoride toothpaste to work on the teeth by not rinsing your mouth with water after brushing. Floss your teeth after every meal. Learn the proper techniques for flossing. Remove plaque deposits with oral cleaning aids such as water irrigation devices. Use antiplaque or antibacterial mouthwash and toothpaste. See a dentist every six months for proper cleaning and checkup. Replace your toothbrush every four months. Avoid consumption of sugary foods and beverages. Gingivitis is a mild form of periodontal disease that may be treated in earlier stages before severe damage occurs. Extra precaution may be needed with gingivitis, as it is considered as a contagious disease by some experts, including the American Dental Association. It is caused by a bacteria strain that may be spread by the shared use of oral items and through kissing. Caring for your teeth and mouth is a never-ending part of good oral health. It starts with proper brushing and flossing techniques, as well as limiting consumption of sugary snacks. By paying close attention to the health of your mouth, gingivitis may be prevented, managed, and possibly even cured. Davis, C., MD, PhD, “Is Gingivitis Contagious?” Medicine Net; https://www.medicinenet.com/is_gingivitis_contagious/article.htm, last accessed October 10, 2017. “Gingivitis,” National Institute of Health; https://www.ncbi.nlm.nih.gov/pubmedhealth/PMHT0023280/, last accessed October 11, 2017. “Is Gingivitis Contagious,” Health Research Funding, June 7, 2014; https://healthresearchfunding.org/gingivitis-contagious/, last accessed October 11, 2017. “Understanding Gum Disease: Gingivitis Treatment and Symptoms,” Dentaly; https://www.dentaly.org/uk/gingivitis-treatment-symptoms/, last accessed October 11, 2017. “Gingivitis,” Trusted Health Products; http://www.trustedhealthproducts.com/health-resources/oral-health/gingivitis/, last accessed October 11, 2017. “Gingivitis,” Mayo Clinic;https://www.mayoclinic.org/diseases-conditions/gingivitis/symptoms-causes/syc-20354453, last accessed October 11, 2017. Chi, A., “What Vitamin Deficiencies Cause Swollen Gums?” Live Strong, October 3, 2017; https://www.livestrong.com/article/425124-what-vitamin-deficiencies-cause-swollen-gums/, last accessed October 11, 2017. “Smoking, Gum Disease, And Tooth Loss,” Centers for Disease Control and Prevention; https://www.cdc.gov/tobacco/campaign/tips/diseases/periodontal-gum-disease.html, last accessed October 11, 2017. “Diabetes,” Mayo Clinic; https://www.mayoclinic.org/diseases-conditions/diabetes/in-depth/diabetes/art-20043848, last accessed October 11, 2017. “Gingivitis,” Medline Plus; https://medlineplus.gov/ency/article/001056.htm, last accessed October 11, 2017. “Gum Disease,” Victoria State Government Better Health; https://www.betterhealth.vic.gov.au/health/conditionsandtreatments/gum-disease, last accessed October 11, 2017.